Is this the 4K PC monitor we've been waiting for? Not quite the perfect panel, but the first 4K screen to really do justice to the super-resolution in-game. Cheaper than many 30-inch monitors. Ten years. It's a staggeringly long time in tech. Back in 2005, you'd be looking at a dual-core Intel Pentium D and its craptastic NetBurst architecture. On the graphics side, it's Nvidia GeForce 6800 and 16 pixel pipes. Wowee. As for storage, the notion of an SSD wasn't even a twinkle in the NAND industry's eye. Yet it was nearly a decade ago Dell wheeled out the monitor by which pretty much all others have since been measured, the 3007WFP, and then the 3007WFP-HC. And, yes, more recently some interesting technologies have cast doubt on the Dell's mastery, that's for sure. But the broader point holds: a decade-long reign at the top is extraordinary. It's impossible to imagine for any other major component. But here we are in early 2015 and it looks like a new high-end default in the monitor market has arrived, at least in terms of the form factor – if perhaps not this actual Philips BDM4065UC. 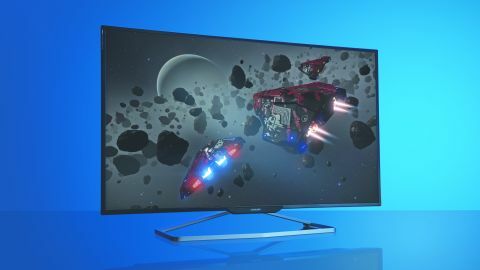 Even before the Philips BDM4065UC arrived at Future Towers, we had a notion that when it came to 4K PC monitors, the HDTV market was going to be particularly relevant. HDTVs have always offered better value for money than monitors because they're cranked out in mega volumes. The problem is, until recently, they've all been 1080p models at best. Once you get beyond 24 inches, that means pretty big pixels. Step that up to 40 inches or more and things get really ugly. Conventional HDTVs, then, have made pretty poor PC monitors. Meanwhile, the first budget 4K monitors have appeared, but offered just 28 inches, diagonally. Hardly titchy, but when you've got nearly 4,000 pixels across the horizontal, the dot pitch is tiny – and that generates all kinds of problems in Windows. Either you leave the scaling at 100 per cent so that everything is squintingly small, or you tweak the Windows and browser scaling settings and everything looks hideous. But what if you had a 4K PC monitor that was 40 inches in diagonal? Then you'd have a monitor on an epic scale with a pixel pitch in that workable window where it's fine enough to enable a crisp, sharp image, but not so fine you have to deal with the scale-or-not-to-scale dilemma. And guess what, 40 inches is bang into budget HDTV territory in terms of panels and production volumes. That explains why this massive, 40-inch, 4K Philips is cheaper than existing 30-inch 2,560 by 1,600 pixel monitors. Hold on though, you can't just take a 4K HDTV off the shelf and use it as a PC monitor. That's because the bandwidth limitations of the current HDMI standard restrict it to just 30fps over a single connection. What you need is the latest DisplayPort 1.2 interface, and you don't get that with TVs. Instead, Philips has taken one of its budget 4K HDTV models, ripped out the TV tuner guff, and bunged in a DisplayPort 1.2 interface to allow a 60Hz refresh from a single transport stream. No frills – just the minimum you need from a PC monitor. That's great news. The main upsides are the affordability – okay, £600 is still a lot of money, but spread that over five, six, seven or more years and the annual cost looks reasonable. Then there's the slimline shape of the chassis and the super-skinny bezel in traditional HDTV style. Sitting next to that epoch-defining Dell 3007, the old master looks tiny, dated and knackered.